The campaign of dehumanization is the first step in justifying laws and policies against those without housing. People who would never use racist, sexist, or homophobic language often use terms like bum, drug addict, psycho, tramp, drifter or transient to suggest that people living outside are somehow less than those who live inside. According to the Holocaust Memorial Day Trust the Nazis used the terms ‘asocial’ and ‘workshy’ to categorize people who failed to conform to their social norms. This group included the homeless, vagrants, beggars, alcoholics, drug addicts, prostitutes, nonconformists, anarchists, the unemployed, and pacifists. 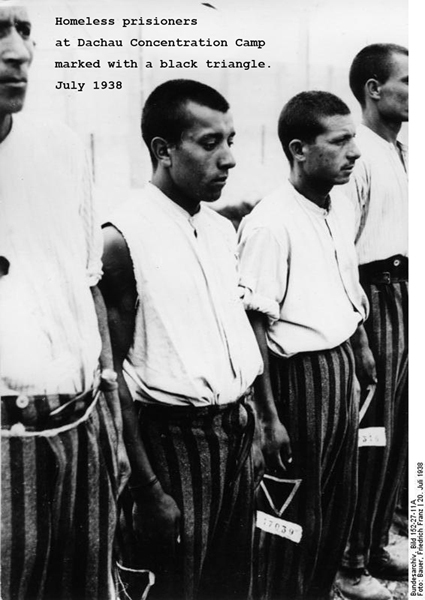 ‘Asocials’ were forced to wear black triangles on their uniforms while imprisoned in Nazi concentration camps. Thousands died in those camps. In the current political climate, this is particularly dangerous. While cities vote for the important positions of declaring their communities a Sanctuary City, sponsor women’s marches and are respectfully silent on the issue of Black Lives Matter authorities are quick to speak in cruel ways about the quickly growing numbers of people who cannot afford a roof over their heads. Officials cannot open shelters, rush to confiscate survival property and pass laws against existing because they do not have the courage to confront those in business who stigmatize those forced to live outside. Millions of people live on our streets. 1 in 7 Americans is part of the world’s poorest 10%. Half of those of us living in the United States are at or below the official poverty line. 41 million Americans struggle with hunger, a number nearly equal to the 40.6 million officially living below the poverty line. One in 30 American children were homeless at some point last year. That’s about 2.5 million kids, and an 8 percent increase to “a historic high,” according to the study from the National Center on Family Homelessness. Just over half are younger than six years old. Minimum wage doesn’t cover the rent anywhere in the U.S.
To solve the crisis of poverty we must end the degrading language against those without housing and start to direct our disgust at the real criminals, government, bank, and corporate officials that refuse to contribute to our communities.